The Atlanta weather has been crazy these past few weeks. One week it was supposed to snow, the next it was sunny, and now its cold and sad looking. I was totally hoping it would snow, but all we got was ice. I got to enjoy a nice, relaxing weekend studying for my Poli Sci exam instead of playing in the snow. What fun, right? 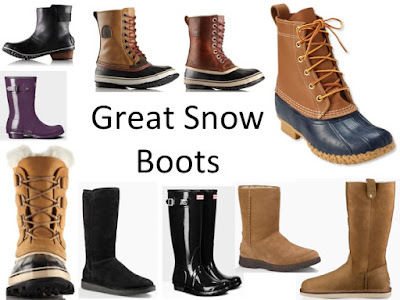 In the hopes of it snowing, I rounded up some boots that would be great for the snow. Hopefully, you'll get snow if you want some or the snowing heading towards you will come to Atlanta. Hunter Boots // I love my short Hunter boots so much that I wrote about them in my 2016 favorites post. My boots would be too short for a lot of snow, but the mid-height or tall boots would be great. With so many colors to choose from, you're sure to find a pair you love. I love the idea of having a plain outfit with a bold pair of rain boots. You can be extra warm by adding a pair of boot socks. Hunter boots will keep you warm and stylish all year. Sorel Boots // Everybody who goes skiing or lives somewhere cold seems to have a pair of these. The brand makes so many options that its hard to decide which pair to get. The insulated boots will keep you warm no matter what activity you're doing. The boots are definitely expensive, but they will be able to be worn for years and years without being destroyed. UGG Boots // This brand is so well known and totally deserves to be well known. The boots ultra soft material can become water resistant with a water resistant kit or you can buy water resistant boots. Lots of their normal boots have started to come in water resistant options in recent years. Everybody who has a pair don't stop raving about how comfy they are. Bean Boots // Anyone who has these boots is obsessed with them. The classic look is perfect in the snow. Although their aren't a lot of color options to choose from, all the color options are incredibly adorable and would look great with any outfit. Some people love to add an extra lining in the boot in order to keep them warm in freezing temperatures. Hopefully, this will bring some snow down South. I've been lusting after the tall Hunter boots for years, but I'm too short for them. They go up above my knees. The Sorrel boots are starting to become a new adore. I love the look, but I think Atlanta would be too hot for the warmth of the boots. What boots do you want? Do you have any of these shoes? What do you think of them?